Seemingly effortlessly mixing the speed and aggression of punk rock music with the structure and twang of country music, Dallas trio, THE VON EHRICS, (named after the infamous Texas professional wrestling clan) write and play memorable cowpunk that veers between the heavy and the heartfelt in equal measure without ever sounding an untrue note (as one of their songs mentions, when you see a VON EHRICS show, you have an equal chance of hearing Waylon Jennings, Willie Nelson, Rancid, or Bauhaus.) The two founding members, lead vocalist and guitarist Robert Jason Vandergryff (is there a more regal rock name in existence?) and bassist Jeffery Wayne Mosley (name checked in a song for being known to cause trouble south of the border), have been playing together since 2000. After a string of drummers, finally solidified the lineup in 2005 with San Antonian Gabe Aguilar on the drums. 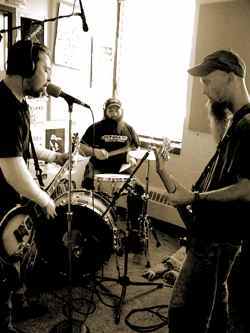 Their 2003 CD, Damn Fine Drunks, was a whirling album of razor-like guitars, four-on-the-floor high-speed train drums, and hilarious and thoughtful lyrics that talk about broken hearts and broken bottles and the hard living that comes from the life of a traveling performer. It was that year as well, that the band decided to hit the road and they’ve continued tour around the country several times a year as well as staying busy in their home region of the Southwest US. In 2005, they released their second full-length CD, The Whiskey Sessions. As far as their future’s concerned, THE VON EHRICS are planning to tour for the rest of the year on this record and are working on a European excursion for the Fall. Then Vandergryff says that their next record might be a punk treatment of their favorite gospel songs (Damn Fine Drunks closed out with an incredible sped-up version of “I’ll Fly Away”.) For right now though, they’ll be in Madison for a special early show at The Frequency on April 18th at 5:30pm. As to what new listeners can expect, “It’s a high-energy show”, Vandergryff says, “and a place to have a good time. People respond to us because we’re authentic, we’re really guys that grew up in small town in Texas, that’s who we are, and we play our version of the music we grew up with. The cowboy hat is real.” You can hear every cigarette burn and beer stain on Loaded as well. It’s like a cage match between Johnny Cash and The Ramones and it’s one of 2009’s most listenable independent albums so far.